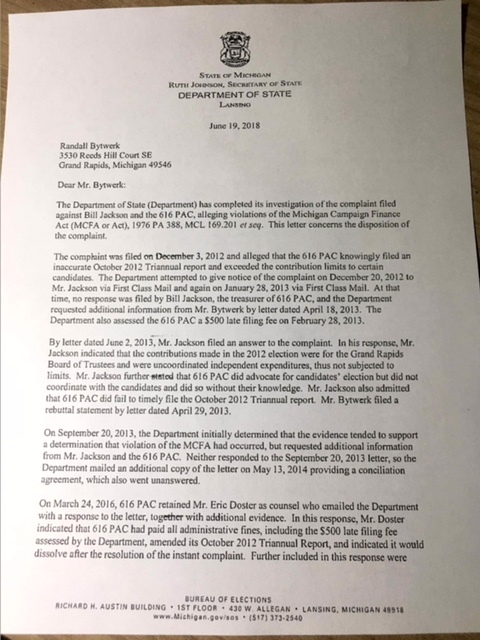 Back in the Fall of 2012 I filed a campaign finance complaint against the 616 PAC for what looked to me violations of Michigan campaign finance law. Let me recap the situation. I ran for the Grand Rapids Township Board in 2012 and was soundly defeated. The four incumbent trustees (Rusty Merchant, Lee Van Popering, Robert Roth, and David Van Dyke ) did no campaigning that I saw (excepting Lee Van Popering, who exhumed a few old campaign signs and placed some of them illegally on Township property). The 616 PAC spent around $6,500 on three mailings supporting the four incumbents. 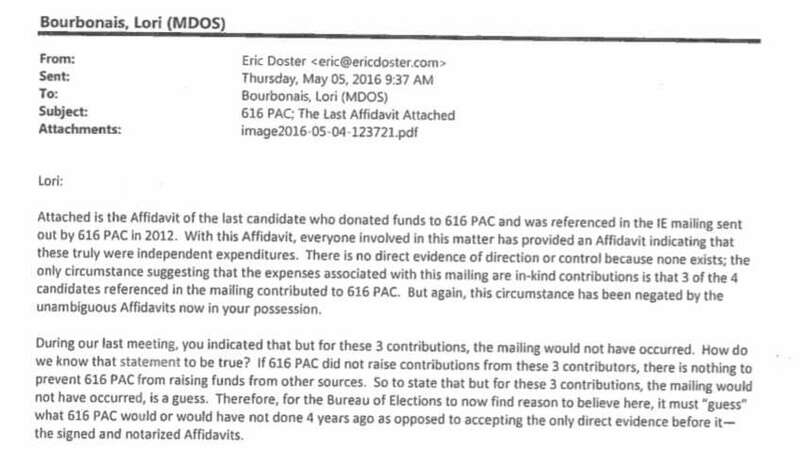 After the election was over, three of the four trustees made contributions to the 616 PAC that nicely covered the cost of the mailings. The question was whether the 616 PAC had acted in complete independence of the candidates, and whether their contributions to the 616 PAC after the election were simply generous contributions of public-spirited citizens, or whether they were made to cover expenses that they knew the 616 PAC had incurred on their behalf. 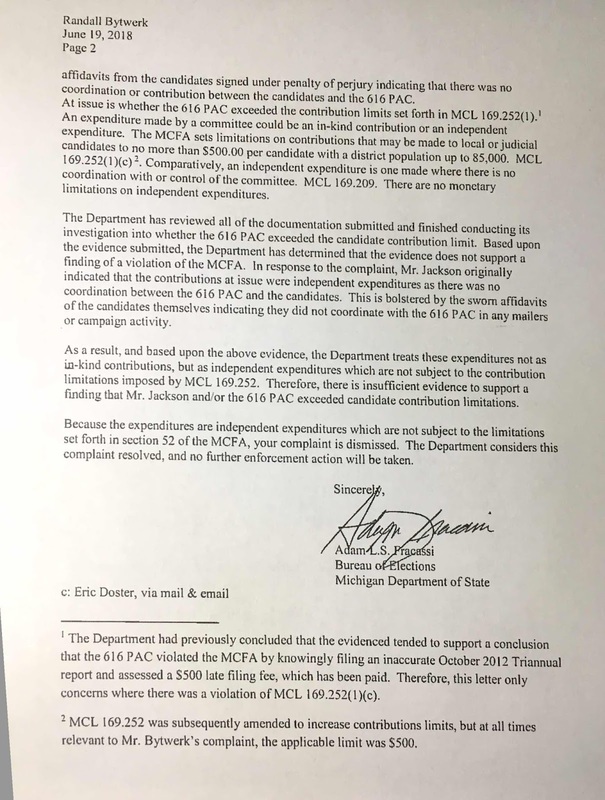 Although Bill Jackson, head of the 616 PAC, worked for Trustee Rusty Merchant’s law firm, they never discussed the fact that the 616 PAC was going to be working to re-elect the incumbents. 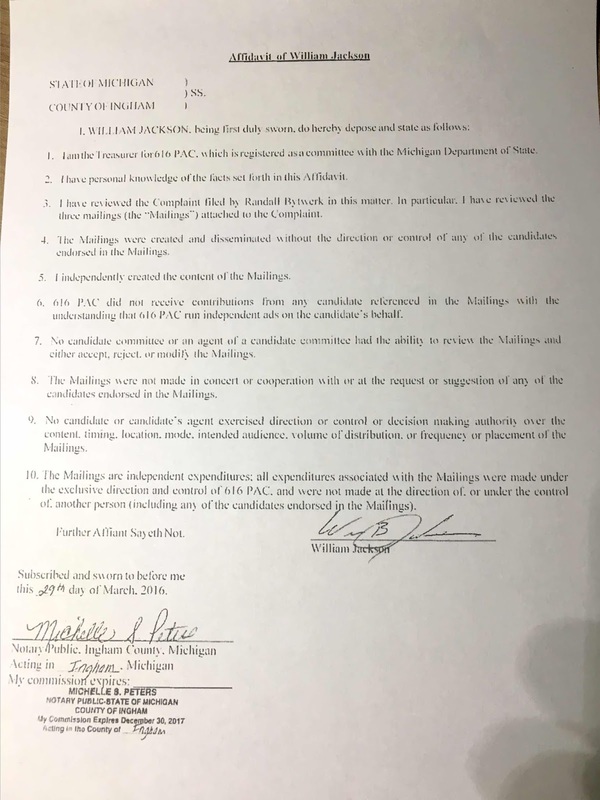 Note the language in Mr. Jackson’s affidavit: “The Mailings were disseminated without the direction or control of any of the candidates endorsed in the Mailings.” It does not say "without knowledge.” One gets the feeling of “a wink and a nod,” and language suggested by a good lawyer. The incumbents collectively agreed it was unnecessary to do any significant campaigning themselves, even though two other candidates were running. 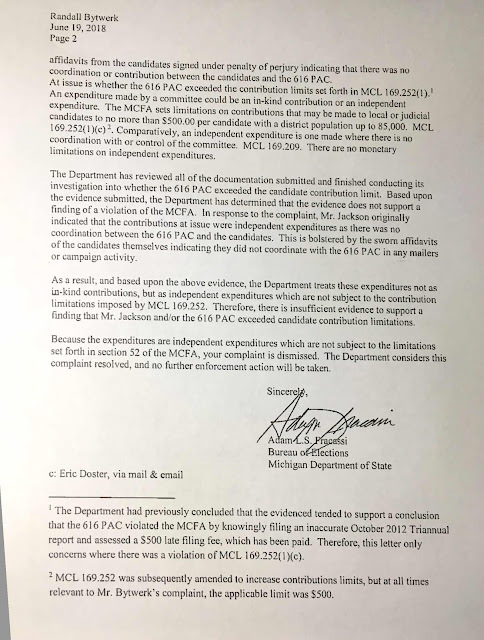 The incumbents made sworn statements that they “did not coordinate with the PAC in any mailings or campaign activity.” They had no expectation that anyone else would take up their cause and were pleasantly surprised when mailings promoting their candidacies appeared unexpectedly in their mailboxes. The incumbents, after the election, contributed out of the goodness of their hearts what the 616 PAC had spent on their behalf, without any prior knowledge of the 616 PAC's activities, or any obligation to do so. As Mr. Doster observes, there might have been others who were willing to donate to the 616 PAC, so the PAC may just have sent the mailings in hopes that contributions would come in from other sources. If anyone believes this, I have some shares in a diamond mine in Bolivia I will sell to you cheaply. In sum, this has been a most interesting experience, although I am left with less confidence in the integrity of a variety of people than I had before it began.